View of the Castle from the South. The castle is open all year round (April to September 09:00 to 19:00, October to March 09:00 to 17:00 ) with an admission price of 200 Lekë. A small bar is situated within the ramparts where refreshments can be purchased. The castle, which is undoubtedly one of the most magnificent structures of the city, sits on a rocky bluff with the city stretching out around it. It offers spectacular views of the Drino valley and surrounding mountains. The castle has undergone various additions and changes over the course of the centuries: The first major fortifications were built under the Despots of Epirus in the 12th and 13th centuries. After the Ottoman conquest of the late 14th century the most extensive improvements were made around 1490 by Sultan Beyazid II. From 1811, the Ottoman governor Ali Pasha of Tepelena added many elements, including the clock tower on the eastern side. He also completed fortifying the full area of the bluff. 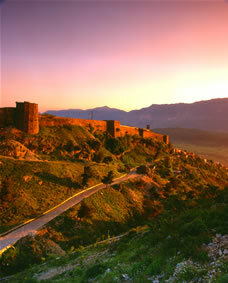 In addition he built an aqueduct to bring water to the castle from distance of over 10 km from the surrounding mountains. Since Ali Pasha’s time the castle has fallen into disrepair. In the 1930s it was redesigned as a prison by the Italians at the request of King Zog, and was closed in the 1960s. Originally opened in 1971, the National Museum of Armaments is located in what was once the part of the prison. The current displays cover Albanian arms from independence in 1912 to the end of World War II, and most of the museum is dedicated to the Partisan struggle against the Italian and German occupation forces from 1939 to 1944. For further information and a free leaflet call in at the Tourist Information Centre. The entrance to the prison is in the first gallery of the National Armaments Museum. Completed in 1932, the prison was used by King Zog’s regime followed by the Italian and German occupation forces during the Second World War, and finally the communist regime until 1968. The only part of the prison that is accessible to visitors was developed as a museum by the communist regime in the 1970s. You may also gain access to the roof of the prison, going up the ramp situated to the right of the main gate. The remains of a United States Air Force T33 Shooting Star are exhibited on the ramparts overlooking the city. The airplane was forced to land at Rinas Airport, near Tirana in December 1957 due to technical problems. 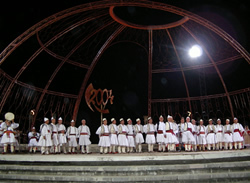 The stage was erected in the 1980s and has for some years been the home of the Albanian National Folk Festival, held every four years (last held in 2004). During the year the stage is used by the municipality on public holidays to present music and dance events.